Nekau II (610-595 B.C.) 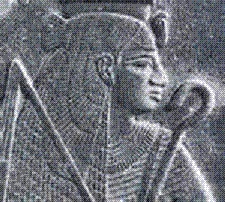 - The last Egyptian pharaoh of any significance (not counting the "pharaohs" during the Ptolemaic period), he was the second ruler of the XXVIth dynasty, the last native dynasty of ancient Egypt. He is mentioned in the Bible as having defeated King Josiah (killed) of Judah at Megiddo in 609 B.C. (II Kings 23:29 and II Chronicles 35:20-23). This was part of an Egyptian campaign into Mesopotamia to try and check the expansion of the rising Babylonian Empire. Babylon had been on the move since the fall of the Assyrian Empire in 612 B.C.. Despite Nekau's (or Necho) initial success against King Josiah, however, he was badly beaten in 605 at the Battle of Carchemish by Nebuchadnezzar II, the son of Babylonian king, Nabopolassar. Domestically, there are conflicting records of Nekau having either starting or completing a canal from the eastern most branch of the Nile Delta to the Red Sea (known as Necho's Canal), thousands of years before the Suez Canal. At the point where the canal meets the Nile, he also built a city called Per-Temu Tjeku. The purpose of this canal and city was to expand trade into the Indian Ocean. Part of the account comes from the later Persian Empire when King Darius either completed the canal started by Nekau, or re-dug it after it had filled-in due to disuse. Nekau died in 595 B.C..